You’re sitting at your usual game, whether it be at your laptop or at your buddy’s table. You look down at your hole cards and see two shiny black aces. Jackpot! You raise hard, and face a couple of callers. The flop arrives with a 4 A 3. You decide to bet small to induce some calls. The turn comes a 2. You’re a little worried, but think logically that no one could have called your raise with anything less than big overcards or a pocket pair, and you feel your three aces must be winning. You bet hard, only to see your opponent flat call. The turn comes … a Q. No way, you think. There’s no way that your opponent could be holding a 5 in his hand after all of your preflop raising. You confidently push your chips to the middle and watch as your opponent rakes in the pot with 5-6 of hearts to make his straight. You feel an intense rage. You cannot believe your set of aces just lost to a pathetic 5-6. You are determined now to take this opponent out anyway you can. “Tilt” is defined in the Merriam Webster’s Dictionary as “to move or shift so as to lean or incline.” In a poker sense, when you tilt, you are “shifting” your normal style of play down a slippery slope of playing way too many hands, staying in with mid-pairs, and not paying enough attention to the other people at your table. There are other noticeable symptoms of tilt as well which I will try to expand on and help detect and stop. For those of you who do not know what tilt is, it is the hot fiery sinking feeling of losing a big hand that you should have won, playing a hand wrong that cost you a lot of money, having negative outside situations affect your poker game, and more. 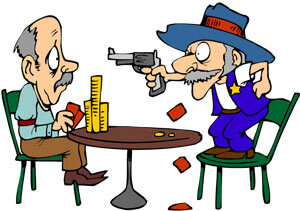 I would like to talk about how to spot the signs of Tilt in Poker so that you are able to delete it from your game. Tilt costs poker players thousands of bets over their poker lifetime. When you start to feel that awful feeling inside that is part of losing in poker, stop for a minute. Sit out a hand and try to think logically. Remember that the most important thing to do is to try to cool off and assess your play. Use your awful beat to think how you could have played the hand differently. Maybe you needed a better read on the player? Maybe you shouldn’t have been in the hand in the first place? There are a lot of questions to ask yourself when taking a break from the action and you can turn that negative feeling of Tilt into a positive of learning from the experience to improve for the future. Should you have raised or folded preflop? Did you make a mistake and slow play your hand? Bet too little enticing a call? Did you adjust your play to your opponent? Did you miss a tell? These type of questions aren’t easy to answer. And they aren’t meant to be. Over thinking is what usually happens until you get so frustrated that sometimes quitting for the night is the best idea. Playing on Tilt is not a good idea. Here are some examples of how tilt will RUIN your poker funds if you can’t control your emotions while playing poker and continue to play whilst on Tilt. Now when you’re on tilt, poker players will play twice to three times as many of their mediocre hands looking desperately for a way to claw back some of the losses from that horrible beat with the only outcome usually being that they continue to lose more. You must TIGHTEN UP when you feel you’re on tilt! Try not playing anything but pocket pairs above 88 and AJ and up for example. This will give you more time to observe the other players at the table and add to your strategy of how to play future hands. It will also give you a much needed chance to cool off. A second example of tilt is paying little attention to the other players at the table. I often find when I am tilting I am so immersed in my own hands and in the past bad beats that I have had that I forget to watch how other people are betting and what kind of stack they have. An example of this is the other night in a cash game I made a fair size raise, but was then re-raised about three times as much as my bet by a smart player who knew that a) I was on tilt and b) he had many more chips than I did (we were playing No Limit Texas Holdem). This type of mistake costs a lot of money in the long run. You HAVE to watch the other players at your table. If you are tilting and aren’t paying much attention, it’s an extremely detrimental combination. Stay interested in the action at the table and plan your future attack. You may have been put on tilt because you made a move that could have been avoided had you had more information. Pay attention and make some poker notes or remember some patterns in your head and use them later. Playing low pairs happens once in a while when you’re not on tilt, but it usually happens because you have some sort of read on your opponent and are fairly confident that your pair is holding up. Low pairs look GOLDEN when you are on tilt. The board reads A-K-7 and you’re holding 6-7? When you’re on tilt you will call bets with great frequency hoping for that third 7 or a 6. When you’re on tilt pot odds don’t matter. You begin to call gutshot draws, low pair draws, 3 flush draws, and other garbage hands hoping to make that one sweet pot. What you don’t realize is that all the money that you are wasting trying to chase down hands is fast depleting your bankroll. When you know that you’re tilting, the first thing that must get into your head is to TIGHTEN UP. This means to play very few hands. The second thing you should be thinking about is taking a break from the action. You need to cool off and try to think about the pot odds and whether or not your opponent had the right odds to be calling your bets. If they didn’t then you should be confident that 9/10 times against the same person you will take their money with ease. So when you feel that hot rush and perspiration, take a break! Hit “Sit out” in your online game or just get up and take a break from a home game. Drink a nice cool drink, listen to some tunes, and when you’re ready to think about poker again, begin to critique how you could have played your hand differently.